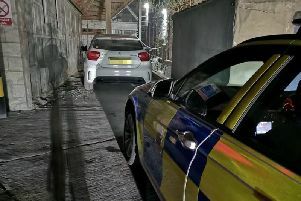 A banned driver who was twice caught behind the wheel of his partner’s car has been spared from being put behind bars. Chesterfield magistrates’ court heard on October 3 how Marvyn Russ, 49, of Ashgate Road, Chesterfield, was found driving after a collision and he was found driving again after he was stopped by police on another occasion. Prosecuting solicitor Lynn Bickley said Russ was driving on Hickinwood Lane, at Clowne, in June, when he was in a collision with another vehicle and police discovered he had been driving while he was banned from the road. Mrs Bickley revealed that Russ’s partner did not support the prosecution and the defendant had agreed to pay for a new car for her. Russ was also stopped by police who had seen him driving on Wharf Lane, in Chesterfield, in October in his partner’s new car when he was still banned from driving, according to Mrs Bickley. The defendant told police he had taken his partner’s car to meet a friend. He pleaded guilty to two counts of taking a vehicle without consent, two counts of driving while disqualified and one count of driving without insurance. The court heard Russ was previously disqualified and he has previous convictions for driving while disqualified. Defence solicitor Paul McLeod said Russ has issues with driving cars but the defendant claimed he had received his provisional licence - which should not have been sent to him - and he decided to drive. Magistrates sentenced Russ to 20 weeks of custody suspended for 18 months with a Thinking Skills Programme and a Rehabilitation Activity Requirement. He was also ordered to pay a £115 victim surcharge and £170 costs. Russ was also further banned from driving for three years.